A child or young person’s EHC plan must be reviewed at least once a year by the local authority to ensure it continues to provide the support the child or young person needs. The annual review is the statutory process of looking at the needs and provision specified in an EHC plan, and deciding whether these need to change. Here is the Council for Disabled Children’s overview of the key duties which apply to local authorities, schools and education providers as set out in the Children & Families Act 2014 (C&FA 2014)1 Section 44, SEND Regs 2014; 2, 18, 19, 20 and 21 and the SEN Code of Practice (CoP) 9.166-9.185. This should be read in conjunction with the CoP. There is a requirement for all Education, Health and Care Plans (EHCP) to be reviewed by the LA at least annually. This is usually referred to as the Annual Review. In Early Years, EHCPs should be reviewed every three to six months (CoP 9.178). The Annual Review is more than just a review meeting, it is a process that must be completed on or before the anniversary of when the EHCP was first issued or the anniversary of the last review. It is laid down in law and in the CoP. There are five steps involved. 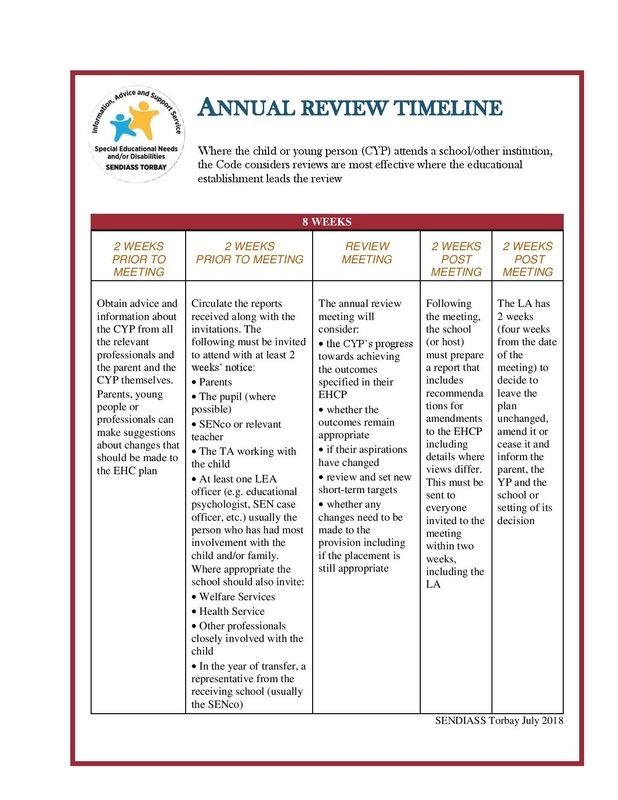 Although the overall review process is the LA’s responsibility, it is usual practice for steps one to four to be delegated by the LA to the school/setting/or other education provider, (CoP 9.173-9.175) referred to for the purpose of this document as the host. The host will write to all the professionals involved with the child or young person, which may also include specific professionals employed by the school. They must also write to the parent/YP inviting them to contribute their views wishes and feelings. This should include their view of the current arrangements and provide an opportunity to discuss changes which the parent/UP may want to be made to the EHCP. These reports should be sent to the host within two weeks of the request being made. The host will then send out invitations to all those required to attend (CoP 9.176), at least two weeks before the date of the Annual Review meeting. The host is also required to circulate copies of all the reports they have received with the invitations. This will usually be the same people they contacted in Step 1 but may include others if it is thought their assistance or contribution may be able required. The Annual Review meeting should be held in the style of a Person-Centred Planning Meeting but in whatever format the meeting takes it must enable full involvement of the parent, child or young person and consider their views wishes and feelings especially when making decisions. (CoP 9.166 to 9.168 and Section 19 Principles). Ensure that points 1-7 (below) are covered and that school don’t simply focus on how things have gone in the past year in school. must check if the parent/YP would like to request a Personal Budget. After the meeting the host must prepare a report that includes any recommendations for amendments to be made to the EHCP. This should include where there are differences of opinions and not just the general consensus. This must be sent to everyone who had been invited and the LA within two weeks of the meeting taking place. The LA must inform the parent/YP of this decision within four weeks from the Annual Review meeting and this date should be no later than the anniversary of either when the EHCP was first issued or the last review meeting. The EHCP must be maintained until the two-month period for the appeal to be lodged at the Tribunal has passed. If an appeal is made to the Tribunal, the EHCP must be maintained until the hearing has taken place and they have given their decision. If the LA decides on option 2 they should make the amendments as soon as possible. (CoP 9.193 -9.198). give the parent/YP at least 15 calendar days to respond with their views. This could include naming a school. (CoP 9.78 & 9.94). They should also be informed of their right to meet with the LA to discuss the proposed changes. If the amended EHCP is issued it should clearly state it is an amended version and be dated. It should be clear which parts have been amended. It should have attached to it the additional reports and the minutes from the review meeting that have informed the decision. It should still clearly state the date the original EHCP was issued as this will still be the date that determines when the next Annual Review is to be completed by. However, a LA can refuse a request for a re-assessment if less than six months have passed since the last EHC needs assessment was conducted, or it thinks that a further EHC needs assessment is not necessary for example because it considers that the child or young person’s needs have not changed significantly. 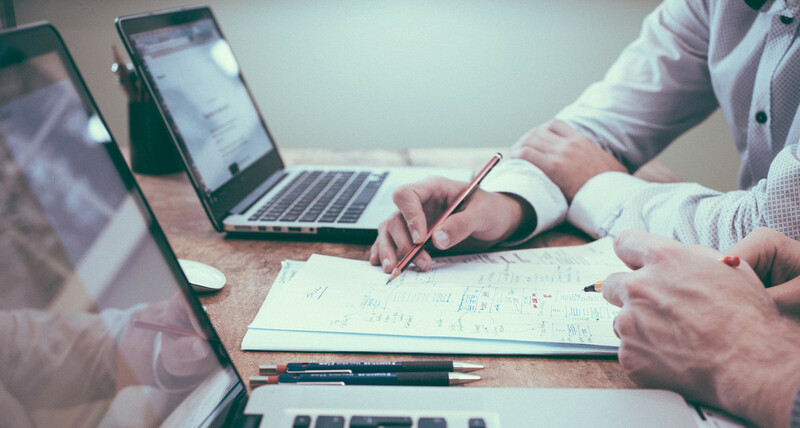 Although the annual review process is laid out in the C&F act, and the Code of Practice the actual format of the meeting will differ from setting to setting but should cover the principles of a person centred review. This factsheet is a guide to the basic process for Annual Reviews but there are some variations relating to particular age groups or specific situations to be aware of. when a child or young person has been released from custody. The Annual Review is required to check all sections of the EHCP not just the educational targets and provision. It can provide an opportunity for parents and young people to request changes and updates. It may also be that what they expected to happen, based on their understanding or interpretation of various elements of the EHCP, may not have been delivered exactly as they had anticipated. Section A Aspirations should be checked to see if they remain the same. There may be additional aspirations to be included perhaps due to new experiences, interests or circumstances. Section B New needs may have emerged or existing needs changed and/or are having an impact on other areas of their life (in or out of school). Or the parent or Children and young people may not feel their needs are described accurately or be a true representation of who they are. An example may be where a need has been described in the EHCP as a behaviour issue when the underlying reason behind the behaviour has now been identified as being due to a communication disorder or learning difficulty. Section C There may be a new diagnosis or on-going investigations. Health conditions included may have stabilised or improved. Alternatively, what had previously been reported as a relatively stable health condition may now be less so. Section D Change of circumstances may have occurred or a more up to date assessment has now been completed that should be included. Parent/YP may request an assessment of their Social Care needs. Section E Outcomes are expected to last for two to three years but they still need to be reviewed to check they are still relevant, SMARTened up or changed (short-term targets will also be reviewed and new targets set). Section F There should be provision to match each need included in B. Perhaps some of the provision didn’t occur or hasn’t been as effective as expected or perhaps there’s an alternative approach that could be tried. Section G Anything included here requires agreement by the LA from the Clinical Commissioning Group (CCG). Any health provision, such as Speech and Language Therapy, that educates or trains must be included in Section F.
Sections H1 & 2 Any provision included here will depend on what needs, if any have been included in Section D. It must be reviewed and may have already changed since it was originally included. Section I If relevant the suitability of the school (or placement) may also be discussed. The parent/YP may want to ask for a different school or type of school if they believe it will provide a better match to their needs. Section J Any Personal Budget (PB) already in place should be reviewed particularly where provision has been amended. This is also an opportunity to request a PB if the parent/YP would like one.